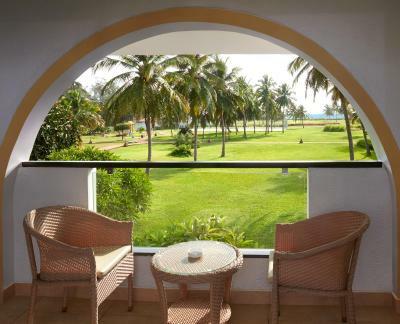 Lock in a great price for Holiday Inn Resort Goa – rated 8.3 by recent guests! Calm & Peaceful location. Beautiful property. The staff was very polite, courteous & helpful. The food was great. 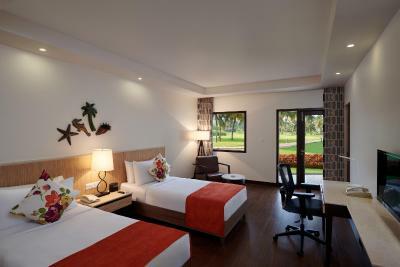 The staff especially Binita are wonderful and changes our room 3 times so that could find the right room. The rooms are very clean and comfortable. The pool area , and beach are very pleasant. Nice breakfast, staff attentive during breakfast and pleasant. We asked for a late check out, and we got it. THE BED WERE VERY COMFORTABLE,THE FOOD WAS EXCELLENT WITH LOT OF CHOICES,THE STAFF WERE FRENIDLY AND HELPFUL,THE AREA IS VERY CLEAN,THE SWIMMING POOL IS WELL MAINTAINED. Breakfast and the hotel location is a major plus point. But the hospitality of the staff is another major plus point of the hotel. I knew that I had made a good choice as we approached the hotel. The entrance is exquisite! The room was beautiful and the facilities excellent. I would like to thank Akhil, Vishal and Kritty in the Restaurant for giving me extra-special care. I would also like to mention Hari, Renzo, Jontey, the chefs and other hostesses. I appreciated all they did to make my stay a memorable one. The service and treatments at the Spa exceeded my expectations. I left feeling revitalized and relaxed. The private beach was an additional bonus. The Gian sunsets are truly fabulous! 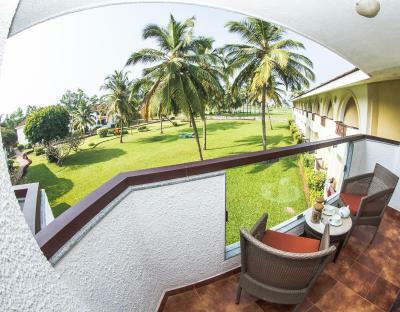 Holiday Inn Resort Goa This rating is a reflection of how the property compares to the industry standard when it comes to price, facilities and services available. It's based on a self-evaluation by the property. Use this rating to help choose your stay! Holiday Inn Resort is located in Cavelossim, along Mobor Beach. Surrounded by gardens, it offers a spa, an outdoor pool and a fitness center. Free parking is provided. 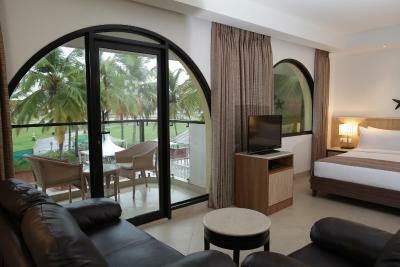 Air-conditioned rooms offer either garden or pool views, with select rooms featuring sea views. A flat-screen TV, mini-bar and tea/coffee-making facilities are provided. 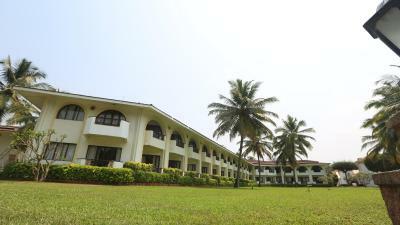 Holiday Inn Resort is 11 mi from Margao Railway Station. Dabolim Airport is 28 mi from the resort. Guests can play a game of tennis, use the business center, or head to the beauty salon. A children’s playground and a tour desk are also available. 5 dining options await guests, including the 24-hour Cafe Mardi Gras, which specializes in Indian and European dishes. Other options include Whispers of the Orient and Fig and Olive. Drinks are served in Sun Downer Bar. 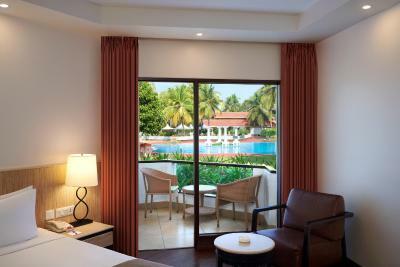 When would you like to stay at Holiday Inn Resort Goa? Attached with a private balcony having a garden view, these air-conditioned rooms feature a wardrobe, flat-screen satellite TV and mini-bar. 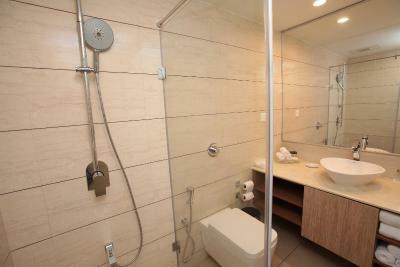 Private bathroom comes with free toiletries and shower facility. Attached to a private balcony with a pool view, tthese air-conditioned rooms feature a closet, a flat-screen satellite TV and a minibar. The private bathrooms all have a bathtub, free toiletries and a shower facility. 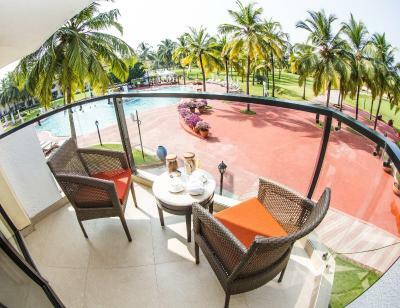 House Rules Holiday Inn Resort Goa takes special requests – add in the next step! Holiday Inn Resort Goa accepts these cards and reserves the right to temporarily hold an amount prior to arrival. The beds. The beds and pillow could be much better. and a must mosquito repellent in the room. Not even a welcome drink was provided. Very noisy groups in the property with a total disregard for others privacy at late hours of the night. Was overall a sad and disappointing experience as even breakfast wasn’t complementary for what was charged for staying. Only one thing, it would be good if the property is able to make soundproof improvements to the room. We could hear loud tv sound from the next room after 10pm. Other than this, everything is really good actually. We like everything, the facilities and the staff, especially the staff at the front desk, they make us felt welcoming staying in the resort. Clarity on check in time as my request for early check in was approved with no cost. However due to non availability we had to wait and waste almost 6 hours in the lobby to get our room. A simple message could have helped to plan our day better. Spread out property and no electric cart. Room was renovated and fitting were excellent. Attentive staff and quick responses. Amenities like tennis racket and balls were provided at a rent. We think these amenities should be made complementary. Quality of bread in bread basket could be improved. Proximity to beach. Food was tasty. Not a single negative thing to say. It was amazing.